From this book, you are gaining an in-depth understanding and appreciation for your teeth and mouth, as well as dentistry’s best and latest treatments for keeping them exceptionally healthy. But an excellent knowledge of dental health and treatment is to a large extent only as useful as the dental practitioner who is your partner. While all dentists go to dental school and are licensed, they vary a great deal in their approach, skill sets, technology, and quality of work. Therefore, it is vitally important that you choose the best dentist for you. So what are the criteria for making the right choice? First off, you need to acknowledge that there are many different types of dentists. Obviously there are pediatric dentists for children, who make the experience much like going to an amusement park and more likely that children have a wonderful experience. Or you might prefer a dentist that caters specifically to adults where you’ve left your kids at home and you don’t have to deal with anybody else’s. Most commonly, there are family dentists. These are excellent for the portion of the population who have attractive teeth, have taken good care of them, and just want to go in for protective maintenance, cleanings, fillings, crowns, etc. This type of patient doesn’t necessarily need a dentist with a broader scope of skills. If the patient continues to take care of their teeth, their family dentist will certainly be fine for them. The considerations grow more significant, however, if you are considering making cosmetic improvements to your smile, or if you have significant problems. If seeking cosmetic dentistry, recognize that a family dentist may not have a lot of experience doing cosmetics. They may offer it, but good cosmetic dentistry requires significant skill and attention to detail. When considering a particular cosmetic dentist, there are certain criteria to keep in mind. Ask if that dentist will give you the opportunity to preview what they would do for you with the use of digital cosmetic imaging – so you can visualize the changes to be made before you invest anything. They should give you a selection of different looks from which to choose. Additionally, will they give you the opportunity to look at pictures of actual cases they’ve completed? Be aware, there are very slick books out there filled with excellent before-and-after pictures that many dentists use in their offices to show you what can be done. But these books are not necessarily showing you what has been done by them, as the pictures are not of their patients. So unless that dentist can show you pictures specifically of their own work, you should be a bit leery about selecting that dentist, particularly for cosmetics. Also, will the dentist show you what your teeth will look like in the form of preview temporaries? These are temporary crowns or veneers that act as prototypes of what the final result will look like. This step alone is one that insures great results as opposed to just hoping for them. If you are getting a cosmetic smile makeover with dentures or implants, the same is true. Does the dentist show you in advance of completion what the final product will look like? Does he or she go even further and set up an extra appointment to modify the veneers, crowns or dentures? If you have or anticipate having problems beyond the simple cleanings, fillings, etc., you would want a dentist with a broader range of skills. Find out if they focus on the diagnosis and treatment of gum disease, since adults lose more teeth to gum disease than for any other reason. Do they do implants, root canals, laser gum therapy and extractions in the office, or do they refer to other doctors? Over the course of your adult life, you are more than likely going to need one or more of these services. A general dentist without experience in complex cases is not the place to go if you have major problems. The norm is that they will refer you all over town from specialist to specialist, sending you from one doctor to the next doctor to the next. There are many potential problems with this. The most immediate is the inconvenience, but there are also communication gaps of time and data where even responsible practitioners can (a) cause your treatment to take many months longer than necessary because of the logistical issues of using the “team of specialists,” and (b) lose and confuse vital treatment information. For example, it can easily take over a week for two responsible, well-meaning and busy doctors just to connect on the telephone. Then after the doctor refers the patient, that patient must endure another wait to get in to see each specialist. One referral to a specialist alone can add several weeks to a month just because of the time it takes for the two doctors to connect, communicate, and get you an appointment. In addition, specific aspects of a case can all too easily get lost in communication. Obviously the doctors will confer, likely by telephone. For example, the original doctor can have an intention of how he wants an implant to be placed, but the implant specialist is not going to be the one putting the crown on the implant and could have a different understanding of what the doctor intends. The specialist’s primary focus is to put in really solid implants. So you may not end up with an ideal result just because two responsible dedicated doctors have communication mismatches. Plus, each time you see a specialist, it is like starting over. You are meeting and greeting a new dentist, having to assess everything about them as you did with your original dentist to see if you feel comfortable and confident with them. Every time you must make a new appointment and assess that new doctor, it can cost you another two or three weeks, plus additional dollars. In addition, what if you are not comfortable or if there is no chemistry between you and the doctor? It’s not just the skill set you should be considering, but personality too. Dentistry by its nature is a very personal thing. You are taking your chances again. There is another kind of comprehensive practice, where the dentist handles all aspects of your care personally. I like to call this practitioner a super dentist. Why? Many super heroes had one specific talent or superpower. The Flash had super speed. Spiderman could create webs. The Hulk was immensely strong. Batman had super technology. But only one of those heroes had most all of the super powers. That was Superman. The dentist who can handle complex cases without sending you all over town could be deemed a super dentist. It is not that he or she does any one particular procedure better than all of his or her colleagues, but it is the fact this doctor does all of the things really well that is significant. So much of what we do is built on trust and relationships. I find it almost silly that dental care so often involves one or more specialists – especially since many of the specialists focused on their area of expertise are not as well-versed in the verbal and people skills as generalists. Why is that? Specialists like oral surgeons and endodontists (root canals) are given their credibility by the referring doctor. They do not need to be interested in building long-term relationships with their patients. The specialists in reality often belong to that group called “The One and Done.” Another perhaps unexpected yet important advantage to having a super dentist is ongoing passion. Those dentists who only aspire to a specific area of dentistry – be it strictly cosmetic, or strictly crowns and bridges, etc. – often experience burnout after a number of years of doing the same thing over and over. Yet after over thirty years of practicing and watching many of my colleagues complain about the monotony of what they do and even look into other professions, I and others like me still get a charge out of dentistry. Why? Because we are always learning and expanding what we know and do!We see a wider variety of cases. Plus, we get immense satisfaction taking a patient, with whom we’ve developed a personal relationship, through all the steps along the way as we solve their health issues, and with them create beautiful and functional results. We change lives on a daily basis and that is truly gratifying and heartwarming! Pride and passion are two qualities highly desirable in a good dentist. Once you decide what kind of dentist best matches your needs, how do you determine if a dentist has those skill sets and traits? Certainly a starting point is to inquire at the dentist’s office as to what services they provide. You may also ask for testimonials or references from patients of that dentist. Plus, today you can certainly Google to see what kind of reviews come up for the dentist and his office. -Do they do gum treatments? Or if you have gum problems, are they going to have to send you to someone else? –Does the dentist do root canals, or every time you have a toothache, are they going to send you to someone else? –Do they do dental implants? –Do they do custom cosmetic dentures? –Do they do Invisalign or orthodontics? -Do they work with the MDs to make sure your overall health is not affected by your dental conditions? These are abilities that a good consumer might seek, and services that the super dentist can provide. Again, it’s important to ask these questions if you have multiple problems. Otherwise you will have to be referred from doctor to doctor to doctor. As said, that will really expand the amount of time it will take to solve your issues, as well as multiply the potential for communication errors. In addition, it might end up being quite a bit more expensive relying on one or more specialists in addition to your own dentist. Even if it is not more costly in dollars – what is your time worth? When interviewing any potential dentist, another aspect to observe is whether the dentist is receptive to your questions. Does he or she answer them in a way that you understand? Communication to and from the dentist is very important. But that responsibility does not lie only with the dentist. The patient must ask questions if they have them. It is also the patient’s responsibility to voice concerns about things they may not be pleased with in some way. Good dentists want your feedback. If you have positive things to say, let them know because that makes their day. But more importantly, they need to be sensitive, willing, and open to hearing feedback about things you feel need improvement. It allows them to do better work, because they know they are catering exactly to your needs and desires. You should also seek out a dentist who is concerned about your comfort before, during and after treatment. Before any treatment begins, the dentist should offer a free consultation. They should be willing to talk with you at the very beginning at no cost to see if the office is right for you and if you are right for the office. If you have complex problems, the dentist should do a very thorough examination appointment, most likely with a fee involved, as they take the time to diagnose your needs. The dentist should be willing to tell you what they are planning for you, why it is planned, how long it will take, how much it will cost, and if there will be downtime associated with the treatment. During treatment, the dentist should do everything possible not to hurt you. A dentist should not promise to never cause any pain because there will usually be some time when that will not be true despite the best intentions. The dentist, however, should certainly promise to stop if he or she is causing you discomfort, and do something to correct the situation. The dentist should also assess your level of anxiety and be able to provide sedation for you if needed. After treatment, the dentist should call you either that evening or the next day if you have had a significant procedure. The dentist should be certain to give you appropriate pain medication so if there is post-operative discomfort, you always have something strong enough to deal with the pain. For peace of mind, the dentist should also be willing to include a written guarantee that they stand behind the treatment, pledging that it will last a certain amount of time as long as you maintain it with proper cleanings and exams. It would also be comforting if the dentist gives you an indication that they’re proud of what was done for you or others, because in many respects, dentistry is really an art. –Concern about you as a human being and your overall health as well as your oral health, so you can truly enjoy life. –The dentist truly seeing themselves as your partner, making sure you get the treatment that is right for you. They listen to what you have to say and explain every part of your treatment before starting. –Attempting to see new patients within one or two days of when they first call. –Offering appointments that work for the patient. That can include seeing patients every day of the workweek, even including early morning and late evening appointments. –An office staff that is trained to make your dental experience as comfortable and pleasant as possible. –The latest technological advances in dentistry, from hi-tech digital panoramic X-rays, to in-office CT scans, to even their own dental lab room. They should be willing to give you a complete tour when you are considering them as your dentist. –Offer a comfortable patient lounge that may include a variety of fresh baked snacks, juices, gourmet coffee, tea, and purified spring water. –Treatment rooms that include movies or music, a warmed neck pillow and chairs with massaging lumbar support. –Office specialists who explain financing and payment options, along with advice on the best way for you to collect any insurance benefits due you. -Access to the dentist, including their home or cell telephone number (this is in addition to your dentist giving you a follow-up call after significant treatment to make sure you are comfortable and satisfied with the work done). -The dentist who goes above and beyond continuing education and professional development requirements to make sure you get the best and latest treatments available. Admittedly, this is a pretty comprehensive listing. Not every dentist will meet all the above criteria, though it certainly is possible. Everything mentioned is something we do in our office. But these may not all be necessary for your needs. You should decide what is important to you, and look for those in the dentist that you select. Having a comprehensive knowledge of dental health as offered in this book, a willingness to be proactive and responsible about your own dental and overall health, and having a top quality or even super dentist as described here – will all go a long way to ensuring that you have the best dental health and well-being possible. Believe me, this is all very doable. That only leaves one subject remaining. 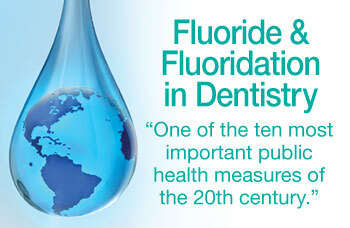 Fluoride – we hear dentists mention it frequently and passionately, so what’s the big deal? This post will answer that question – going into detail about what fluoride is, how it promotes excellent dental health and the methods for application. What are the Dental Benefits of Fluoride? 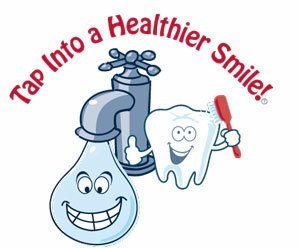 The primary dental benefit of fluoride is that it reduces the risk of cavities. Fluoride replaces the softer, weaker parts of your teeth with strong materials, preventing against cavities and tooth breakage. It is helpful during the development of teeth and has proven advantageous in adult teeth as well. 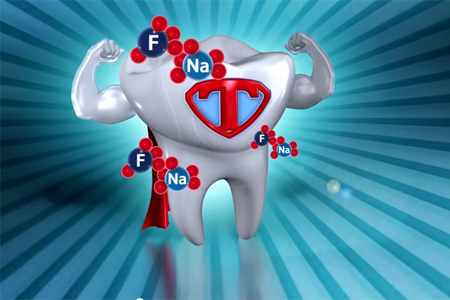 In short, fluoride is best described as a mineral that is your lifelong dental ally! How is Fluoride Applied or Consumed? There are two effective ways to receive fluoride: topically and systemically. Topical fluorides are those placed directly on the surface of the teeth – examples include brushing and rinsing with fluoridated toothpaste or mouthwash. Other examples can be found at the dental office. At Barotz Dental, we offer two forms of fluoride: a foam and a varnish. Since both methods are effective, you get to choose your style of fluoride based on preference, comfort, and flavor choice. Fluoride can also be consumed systematically, meaning it can be a part of your everyday diet. The most common way we consume fluoride is through our water sources, but other ways are through different foods and supplements. With all of this in mind, it’s no wonder the American Dental Association and dentists across the country are constantly promoting the benefits of our trusted dental ally – fluoride! You may have heard about dental sealants during a visit to the dentist. You may have even had sealants placed when you were younger. So, what are sealants? Sealants are a dental treatment designed to prevent tooth decay, especially in the back teeth. All teeth have grooves on the surface, but teeth in the back usually have much deeper grooves – so deep they’re even visible to the eye. These grooves and pits create a trap, providing a home for abnormal amounts of bacteria and debris to build up. The purpose of dental sealant treatment is to lessen these grooves and reduce the amount of buildup that can occur, especially in the back teeth. While sealants prevent bacteria from building up in the small grooves in your teeth, they also promote better brushing because the bristles make contact with more of tooth surface areas. So what does the process of getting dental sealants involve? It’s a quick, simple and noninvasive procedure. Many dentists recommend sealant treatment for 16 teeth: the four rearmost teeth in each quadrant. The treatment can be completed in under one hour, but will save you years of pain and hassle! Once applied, sealants can protect your teeth for at least five years, and much longer in many cases. At Barotz Dental, we offer Total Dental Solutions and can handle every aspect of dental care that you desire or require, including sealants! If you are interested in sealant treatment, call us today at 303-595-4994 for more information. In certain situations, a general dentist may recommend you undergo a frenectomy procedure to improve oral function, appearance and, ultimately, quality of life. The best way to understand the frenectomy procedure is to understand the frenum. The frenum is a small tissue attachment inside the mouth and gums. As you can see in the image on the right, there are two kinds of frenum in the mouth, the labial frenum and the lingual frenum. When is a Frenectomy Necessary? Frenectomies are needed when a frenum impedes functionality of the mouth or causes other dental problems, such as pain or speech issues. Why Have Your Frenectomy at Barotz Dental? At Barotz Dental in downtown Denver, comprehensive and advanced frenectomy treatments are part of our Total Dental Solutions offering. In addition to frenectomies, Total Dental Solutions enables Dr. Barotz and the team at Barotz Dental to handle all aspects of your care in a quick, comfortable and personalized manner. We believe in providing Quality Quickly, and our advanced PerioLase equipment allows us to offer frenectomy treatment that is fast, excellent and only minimally invasive because it reduces the pain and bleeding after the procedure. Our team also recognizes that frenectomies can sometimes be more urgently recommended treatment. At Barotz Dental, we will work with you and your schedule to expedite treatment that is considered time-sensitive. If you are possibly in need of a frenectomy, call us at (303)595-4994 today and we’ll happily set up a no-charge consultation that fits with your schedule! Implant Dentistry Impacting Dental Diagnoses? At Barotz Dental, we see it on a near weekly basis: a patient visits our office for a complimentary second opinion consultation with Dr. Barotz after another doctor has recommended they have all their teeth pulled. In some cases, we find the previous doctor’s diagnosis to be correct, and determine that the teeth are not saveable. However, more often than not when seeing a new patient for a second opinion, their teeth are saveable. Dr. Barotz is often surprised at how quick some dentists are to recommend pulling teeth in favor implants saying, “When I was in dental school, they trained me to save teeth!” At Barotz Dental, it is always our goal to help you save as many of your natural teeth as possible while also helping you achieve the smile you deserve. Why is it that so many dentists are recommending dental implants before attempting to save salvageable teeth? This article shared by the Institute for Advanced Laser Therapy sheds some light on possible answers to that question. Dr. Barotz once helped a patient save her teeth after five other doctors had told her she would have to have all of her teeth pulled. See the uplifting story for yourself here. It has been our mission since 1980 to provide a dental experience that is both personalized & comfortable. While we take great pride in helping patients save teeth that other dentists said they would have to lose, we have helped hundreds restore the smile of their dreams thanks to implant dentistry. The bottom line is that opting for dental implants is a major physical, emotional and financial decision in life. If you are considering dental implants, or have been told that you will need to have your teeth pulled, Dr. Barotz urges you to seek a second opinion. Barotz Dental offers complimentary second opinion consultations for this exact reason. Please call us and arrange your consultation today. This new nasal spray allows us to numb teeth in the center of the upper arch without using a needle. At Barotz Dental, we provide Total Dental Solutions in a manner that is both personalized & comfortable, and Kovanaze will play a significant role in that going forward. 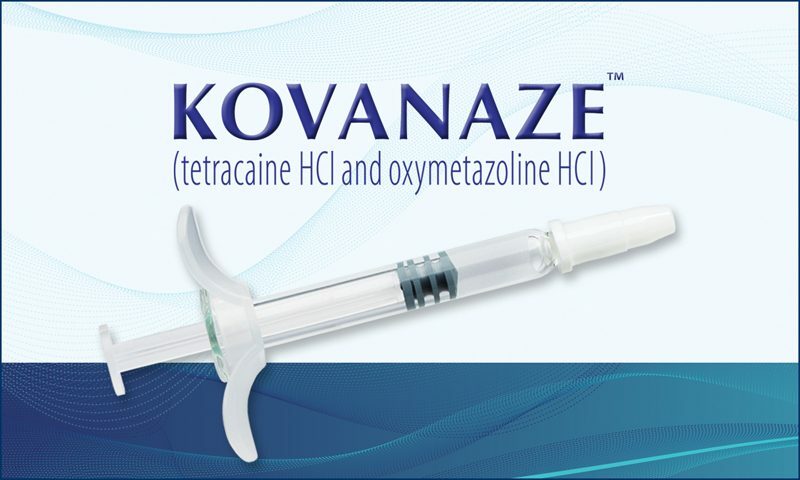 Kovanaze provides regional, pulpal anesthesia with 96% efficacy in teeth Nos. 5–12, therefore Kovanaze offers a needle-free alternative to the majority of anterior maxillary injections. Additionally, patients may not experience the same sensations of numbness or tingling of the lips and cheeks associated with injectable dental anesthetics. Kovanaze is the first no-needle regional, pulpal anesthetic administered via nasal spray to be approved by the US Food and Drug Administration (FDA), and it offers patients a safe and effective, needle-free alternative to anesthetize teeth 4-13 for restorative dental procedures. In the past, treating severe gum recession required grafting surgery, an extremely painful procedure because it harvests gum tissue from the palate of your mouth to correct the recessed areas. While the scalpel, cutting and stitches are scary indeed, the worst part for most patients is the enduring pain stemming from the tissue that is removed from the roof of the mouth. Gum recession is an all too common problem today. Many patients have had their recession treated with the painful grafting procedure because, in the past, it was their only option. Fortunately, the amazing advancements in modern dentistry allow us to now correct even the most complex issues in the least invasive manner possible. Gum recession treatment is a perfect example of how modern dentistry is allowing people to achieve the smile of their dreams without subjecting themselves to scary and painful surgeries. 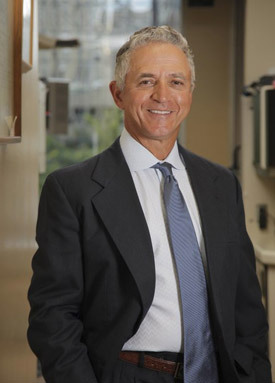 Dr. Barotz has been treating gum recession since 1980. Until recently, he would always wait until it was absolutely necessary to recommend treating recession because of the painful ordeal grafting surgery put his patients through. Why subject someone to weeks of misery and agony unless the status of their oral health dictates it? But now, with the emergence of the Pinhole Technique, Dr. Barotz is recommending his patients correct their gum recession with much greater frequency. In this article on DentistryIQ.com, Dr. Tina Beck of San Diego explains how the Pinhole Technique allowed her to treat a patient who was previously deterred by the idea of palatal grafting surgery. Many people need to correct gum recession because it impacts the health and stability of their teeth. Others may choose to have recession corrected for cosmetic reasons. In either case, the Pinhole Gum Rejuvenation Technique has proven the quickest and most effective treatment solution available today. The Pinhole Technique can be accomplished so quickly that its inventor, Dr. John Chao, has nicknamed it the “Lunchtime Gum Lift.” The procedure has proven to be so relatively gentle that many patients report feeling just fine the next day and some have even reported feeling no pain at all. See some of the amazing results for yourself below! For more information on the Pinhole Gum Rejuvenation Technique, check out our website and request a free informational report here! The benefits are many, with the most notable among them being reduced recovery time and minimal pain. Barotz Dental offers complimentary consultations so that you can learn about the procedure and Dr. Barotz can determine if you are a candidate. If you are worried about gum recession, call (303)595-4994 today and book your no-charge Pinhole Gum Rejuvenation consultation!